Make a TRENDING spiral knot Macramé bracelet with cute rose gold charms! Fold a 30cm length of cord in half and use a larks head knt to secure it to the parallel side of the hexagon. Repeat for the opposite side. - Repeat this process on the the same side each time. After you have make 12 knots, slide a bead onto the centre cords and continue to knot until you have made two inches all together. Take the 4 ends of the centre cords, lay them side by side and then do a macramé braid (approx. 6 or 7 square knots) for your sliding knot. The square knot is like the sliding knot, but you repeat the steps on the opposite side. Secure the ends with a drop of glue, being careful not to glue the sliding knot to the centre cords running through it (otherwise it will not be able to slide and adjust). Try gently pulling the centre cords through the sliding knot while the glue dries. Trim the ends so the sliding knot is neat. Tie on your key charm and beads to the ends of the cords. 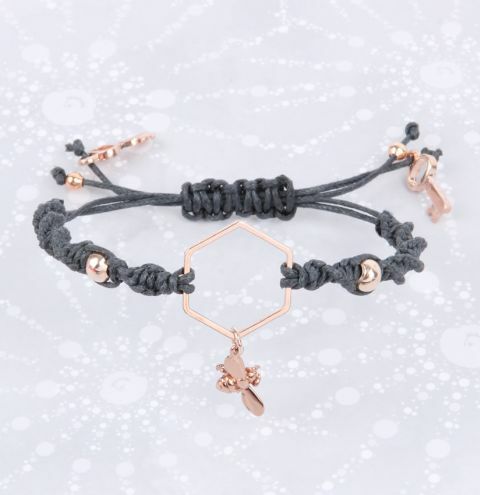 Attach the bee to the hexagon charm with a jumpring.